It’s hard to believe that winter is coming to an end and it’s already March! The temperatures outside today nearly felt like spring. Though the sky was a bit overcast, and it appeared rain was on the horizon, we couldn’t resist taking a quick walk through Fowler Woods State Nature Preserve. 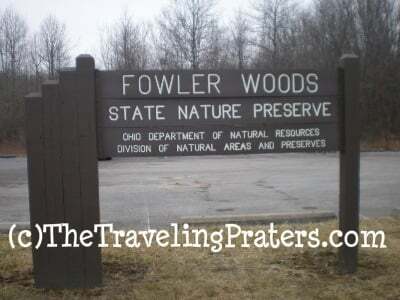 Located about 20 minutes north of Mansfield, Fowler Woods is one destination that you won’t want to miss when the wildflowers begin to bloom. 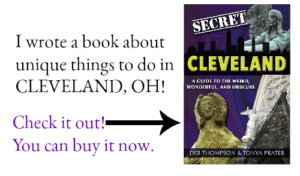 It is said to be one of the best places in Ohio to view the spring wildflowers. But no matter what time of year you choose to visit, if you look closely, your walk is sure to be full of surprises! We briefly experienced a pang of disappointment when we pulled into the parking lot and read the sign that said No Pets! 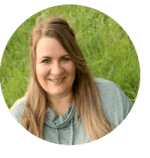 We were looking forward to walking with our puppy and felt so terrible leaving him behind! I tried to convince myself that No Pets really meant, only if other people were there. Since our vehicle was the only one, I reasoned that it would be okay to take him with us. My husband encouraged me to read the sign again and put the dog in the car. So, we put our disappointed puppy back in the car and knew that was the right thing. Rules are rules. One thing we love about this nature preserve, is that the entire 1 1/4 mile trail is a broadwalk so it is easily accecessible for strollers and wheelchairs. The only problem with the broadwalk is that it has become slightly moss covered which leads to some really treacherous, slippery conditions when damp or wet. The kiosk does have a sign warning visitors of the slippery walkway. 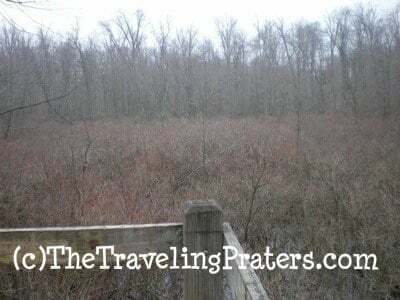 We continued to the observation tower that overlooked a swampy area. After we had spotted one forest dweller, I was hopeful that we would see more. I really didn’t need to be optimistic about that prospect, my daughter hasn’t really learned how to be quiet while we’re hiking yet. 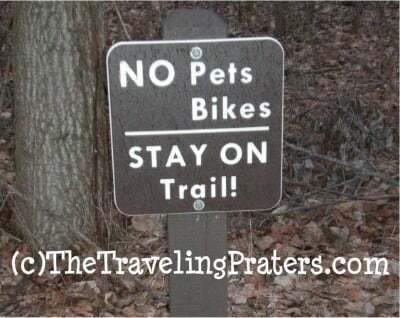 We tease her that instead of allowing us to enjoy nature, she scares it all away! On a final note, you should be aware that the nature preserve does not have any restroom facilities on the premises, so go before you go! Also, remember that I mentioned the walkway can be slippery in damp conditions? It began to rain while we were on the last leg of the trail, so my husband decided to race my boys back to the vehicle. My 16 year old had no desire to let his “old man” beat him, so he turned a corner without slowing down and wiped out! Determined to win, he was up in a flash, back on his feet and passed his Dad just in the nick of time! After winning, he sat down to nurse his wounds! So, just remember, Slippery When Wet and be cautious! Now that we have moved back to Ohio, I plan to visit this nature preserve on a regular basis. Just as long as it’s dry and I’m wearing shoes with plenty of tread for traction. From Mansfield- Head North on State Route 13 towards Norwalk. You’ll go about 12-15 miles or so to Noble Road. Turn right onto Noble Road. Go past the landfill (isn’t that appropriate- a landfill right by a nature preserve?) to the first road on that crosses Noble. Turn right onto Olivesburg-Fitchville Road. You’ll find the parking lot on the right hand side. 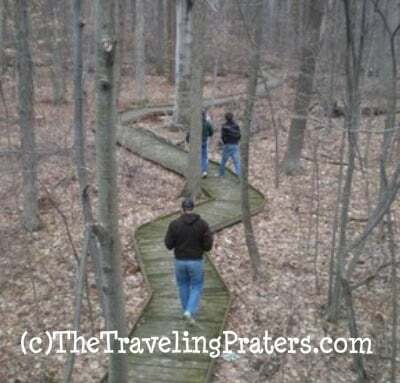 What other nature preserves would you suggest visiting in the great state of Ohio? This looks like a nice place to visit, especially in springtime when everything starts to come alive. I’ll be making several stops at Fowler Woods this year. I really want to see the tree frogs that make an appearance each year and of course the spring wildflowers will be a must! I’ll try to update with some pictures later in the season.